It should come as no surprise that nearly the entire book offers a rehash of information provided in the various Call of Cthulhu-related tomes. This is precisely as it should be; one cannot assume that a person picking up this book for the first time will know everything they need to regarding the background and 1920s-era setting. I offer this as a warning to the already initiated to be patient, and to feel free to skim the background chapters at first. Where True 20 differs here is in the three character roles – Adept, Warrior and Expert – that players’ characters will adopt. It is recommended that players only choose Adept as a starting role with the consent of the Narrator or GM; frequently in this setting, the mantle of Adept is taken by either cultists or by those experienced in the ways of the Mythos. It would be commonplace for a character to grow into the role of Adept during the course of one or more campaigns, but rare that one would start out that way. The first chapter details the ins and outs of character creation, adapting the game for the True 20 rules toolkit. Chapter two gives a general overview of all aspects of life in the 1920s, and chapter three offers advice and information for the GM on narrating Shadows of Cthulhu. Chapter four covers True 20’s rules for insanity, dealing with the inevitable plunge from reality – a plunge all too common to all investigators of the supernatural and other-worldly. 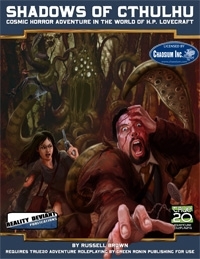 Chapter five converts the character abilities from Call of Cthulhu into the Skills, Feats and Powers lexicon of True 20. Chapter six – everyone’s favorite – is the bestiary of critters from the Cthulhu Mythos. Chapter seven – titled “Terrible Things” – details in game terms the places, books and artifacts associated with stories from the Mythos. Chapter eight discusses NPCs — cultists, Adepts and ordinary people. Chapter nine offers the village of Dunwich and its environs as an appropriate setting for adventures. The setting for “The Dunwich Horror,” Dunwich is a mythical New England village seemingly frozen in time in the latter part of the 19th Century (or earlier), and was the site of horrific events resulting from several inhabitants’ close involvement with Things Man Was Not Meant To Know. Chapter ten closes out this book by covering in greater detail True 20’s rules to govern the use (and abuse!) of sanity in the game setting. The art by Jason Walton is excellent. Scattered throughout the book, it is sparse enough to not overwhelm the text, but frequent enough to maintain visual interest and to help set the tone for the game. My favorite piece is a full-page illustration from page 33, depicting a town at night as mist begins to creep in. The pre-19th-Century architecture of the town indicates it is either in Europe or a very remote area of the Eastern United States. There are no monsters, or any other living beings present — merely the suggestion, through the use of shadows and judicious placement of obscuring mist, that there may be more to the scene than meets the eye. Imagination is given free reign in this image, which is what role-playing games are all about. A couple of very small quibbles; why is page two entirely blank? Most likely this is to facilitate printing the full-color cover page, either for the consumer directly from the PDF download, or to prep the product for eventual conversion to a commercial print run, if product sales indicate the need. Another problem is the two-column format. While standard for commercial printing, in electronic form it is a cause for aggravation as one has to scroll up and down several times to read information on a single page. This isn’t issue for those who take the time and toner to print out a hard copy of the PDF. All in all, Shadows of Cthulhu is a welcome addition to any Lovecraft aficionado’s store of Mythos gaming lore. The 124+ pages are well worth the price of the download, even for those anachronistic types like myself who prefer a printed, bound book to caress and scan. It’s a cohesive, well planned coverage of the Cthulhu Mythos using a rules system other than Chaosium’s fine Basic Role Playing system. I would be remiss if I didn’t mention that, in my role as Sales Manager for Green Ronin Publishing – publishers of the True 20 RPG – I’m somewhat less than unbiased. That in mind, True 20 is a strong tool to offer fans of 3.0 to 3.5-era D&D a solid option for using a familiar game system to play other games in diverse time periods and settings. Having such an excellent product available in support of the True 20 product line makes that part of my job a lot easier. Look for more True20 products at the Flames Rising RPGNow Shop. Shadows of Cthulhu Now Available!